Nowadays, WiFi is seen everywhere in our daily life and Arduino microcontrollers are getting more and more popular. 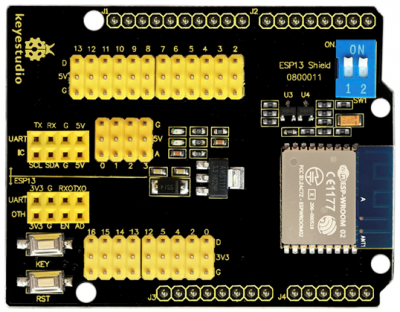 The keyestudio ESP13 shield is particularly designed for Arduino microcontrollers to connect the WiFi. 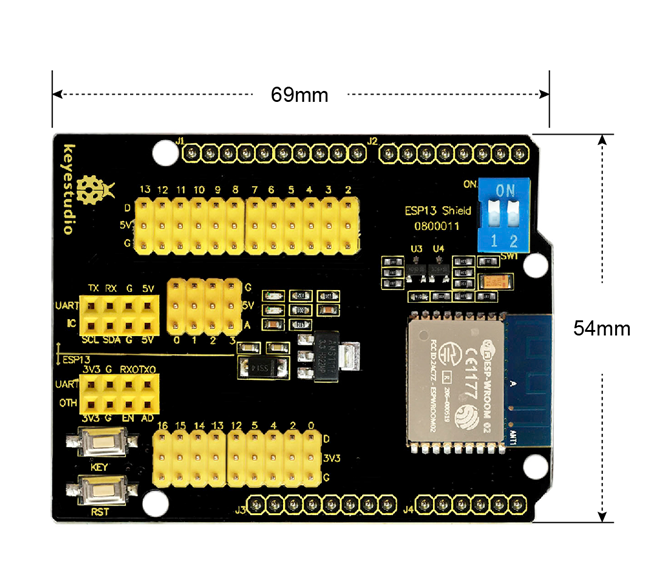 It adopts industrial grade chip ESP8266. It is ESP-13 with metal shield, with strong anti-interference ability. 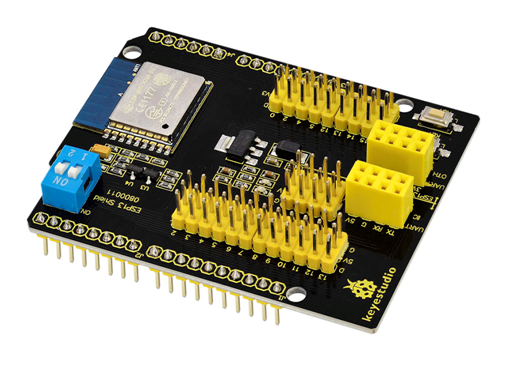 The pin is compatible with the main control board such as Arduino Uno and Mega2560. Meanwhile, it uses the voltage conversion chip when connecting the Arduino MCU, which compatibles with 3.3V and 5V. The serial port of the shield is controlled by a dual-dial switch, so that it can be used alone as an Arduino MCU expansion board or as an ESP8266 shield. 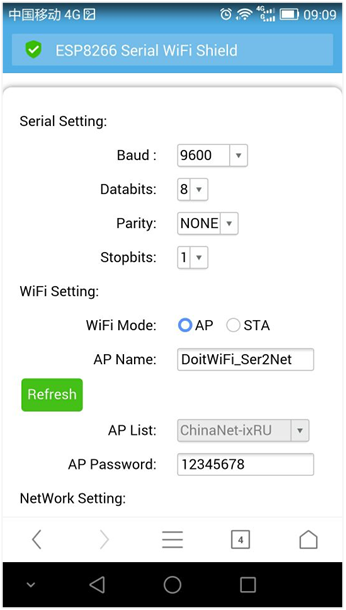 It configures WiFi and serial parameters based on Web Server. It can not only be used as an independent ESP8266 development board, downloading official AT command firmware, NodeMCU open source firmware and so on, but also can be used as a stand-alone Arduino UNO shield, with all leadout pins. Support wireless 802.11 b/g/n standards. Built-in TCP/IP protocol stack, able to configure a socket. Support standard TCP/UDP Server and Client. The serial port baud rate supporting 1200/2400/4800/9600/19200/38400/57600/74800/115200 bps. Two DIP switches enable extended switching between the Arduino and ESP8266 serial ports. WiFi operating current: continuous transmission≈700mA(200mA MAX), standby <200uA. The shield is default by firmware supporting AT command. And the firmware version is v0.9.5.2 AT Firmware. Open the serial debugging tool, set well as below, click to test AT, the board will return OK. Serial communication between Arduino UNO and the shield. 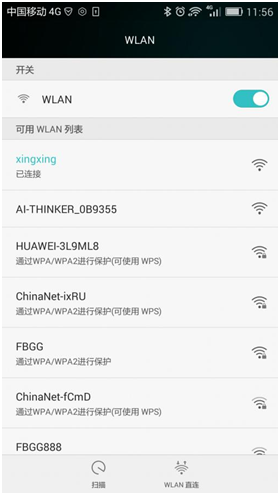 In the code, we have set the wifi working mode, name and password by AT command. 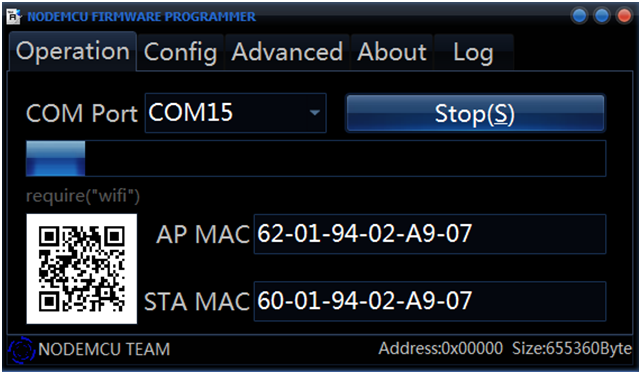 If need to change the mode, can select the corresponding AT command from debugging tool . Upload well the code to Arduino UNO, stack the shield onto UNO board and power on, it will directly connect the WIFI on the phone without password. Shown below. 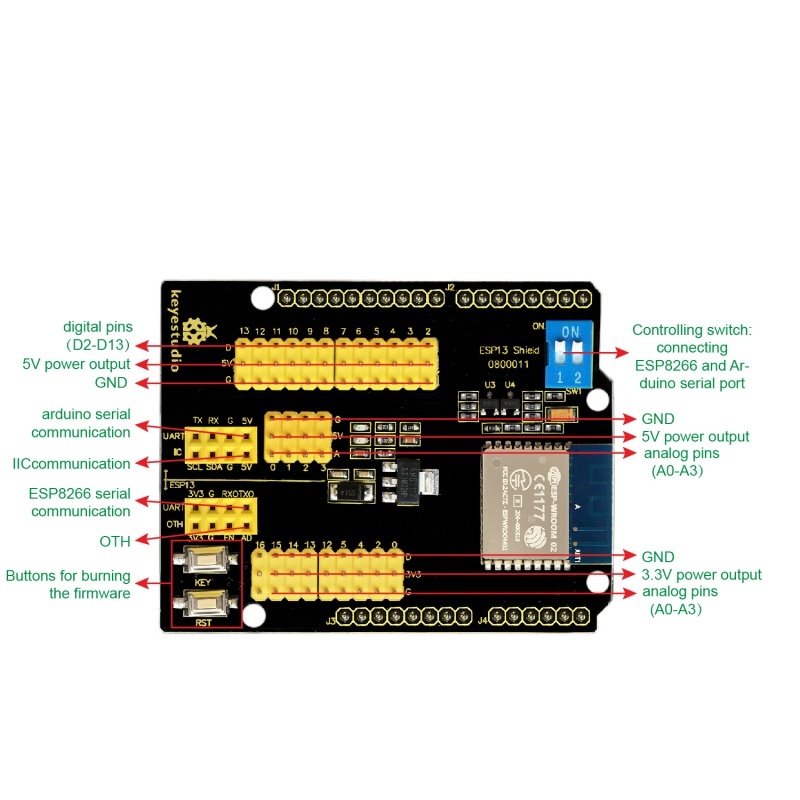 Powering the Arduino control board, in the range of DC7-12V, separately connect the pins GND, 5V to GND, 5V of WIFI shield. 1) Open the ESP8266Flasher programmer, select the COM port. 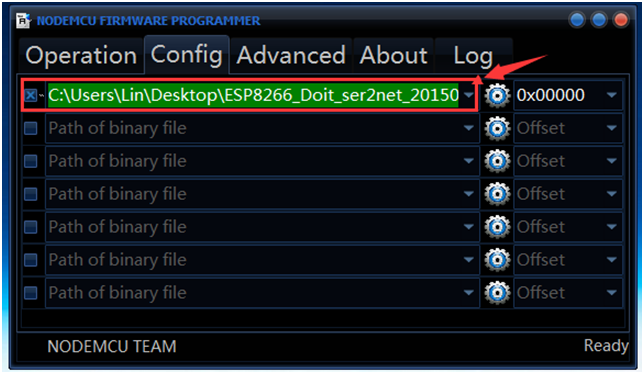 2) Click Config,select the firmware version ESP8266_Doit_ser2net_20150723. 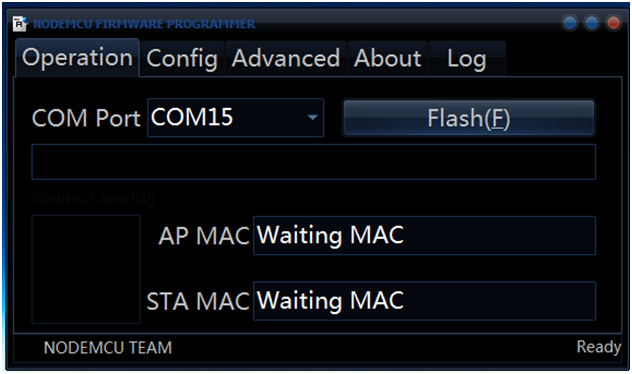 3) Click Operation, click Flash , press the button RST, then press the button KEY, start to program the firmware shown below. Program well the firmware, power off to restart. Powering the Arduino board, in the range of DC7-12V, separately connect the pins GND, 5V to GND, 5V of wifi shield, then open the WIFI on the phone. Enter the WiFi shield address：http://192.168.4.1 on the browser. Shown below.